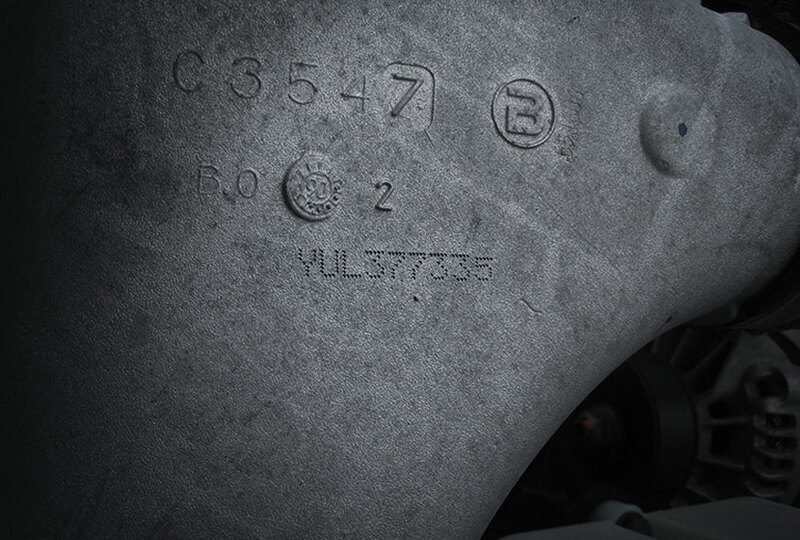 Our patented Intensive Antitheft Marking® involves etching a unique alphanumeric code on main vehicle components. This code, which is associated with the vehicle identification number (VIN) and stored in a secure database, makes it possible to trace the rightful owner. Access to Sherlock databases is restricted to law enforcement personnel, insurance company investigators, and border services agencies. But proof of your vehicle’s Sherlock protection will be visible to those in the know, in the form of our discreet but distinctive “golden crab” logo. The golden crab symbolizes Sherlock’s proven ability to protect against vehicle theft. We also offer an extensive partner network and potential discounts on your vehicle insurance. Learn more…. We ensure that our product consistently meets Sherlock’s high quality standards in order to keep users protected and retain the trust of insurers. Our Intensive Antitheft Marking® is a powerful deterrent for professional thieves, reducing your risk of theft by over 80%. Our extensive partner network of 650 service outlets ensures that Sherlock meets customer expectations and offers the best possible product. Most insurance companies offer substantial discounts for owners whose vehicles have Sherlock protection. Sherlock’s patented Intensive Antitheft Marking® process incorporates sandblasting and etching processes. It’s discreet, using no electronics or toxic substances (like chemicals or acids) that could mar your vehicle’s finish. And this eco-friendly process can be performed at any time, regardless of weather conditions. 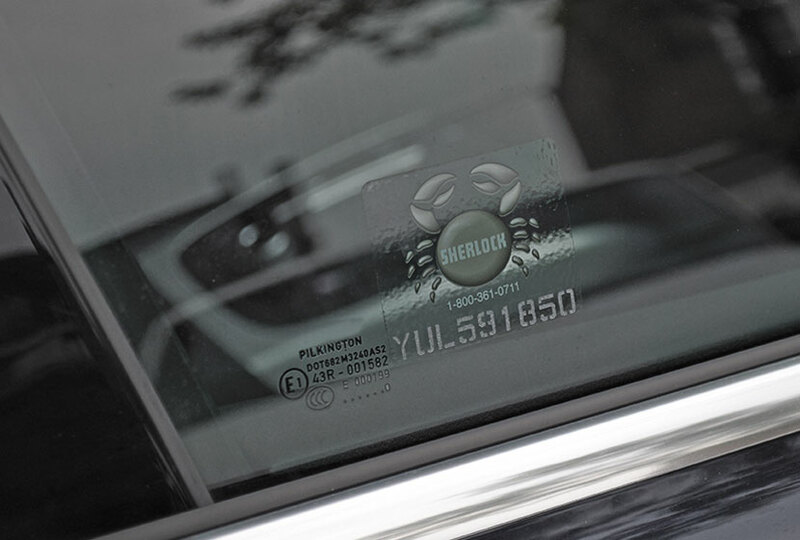 Vehicles protected by Sherlock are easily recognizable: just look for the distinct golden crab and discreetly engraved—but highly legible—code. Sherlock Intensive Antitheft Marking® as well as inspection and certification of previously marked vehicles. Sherlock services aren’t just for automobiles—learn about the many types of vehicles we can mark or inspect. 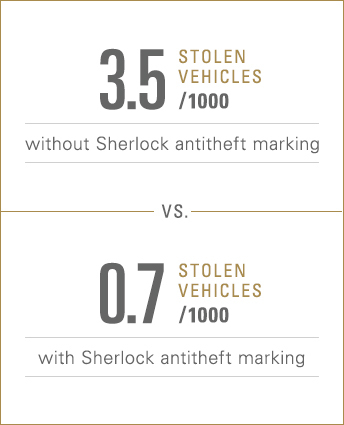 To show just how effective Sherlock Intensive Antitheft Marking® is at protecting vehicles from professional thieves and chop shops, we asked a well-known actuarial firm to measure and analyze theft rates for vehicles with Intensive Antitheft Marking®. The actuaries analyzed 10 years of data, looking at theft rates for nearly half a million vehicles with Sherlock marking. They concluded that the resulting effective rate was 81%. In other words, Sherlock Intensive Antitheft Marking® reduced the risk of theft by 81%. No other security company can cite such serious, credible findings.
" Statistics show a significant reduction in theft rates for vehicles with Sherlock marking over an extended period. " It’s elementary! Compare our exclusive offer to that of the competition and you’ll see that Sherlock is the smart choice. See for yourself.